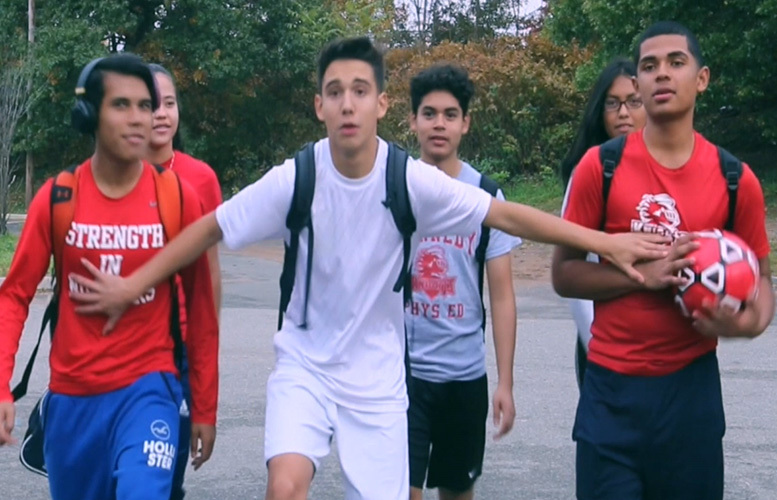 The John F. Kennedy High School soccer team won the Pepsi and New York City Football Club video contest, earning a free soccer clinic. Students created and submitted a 45-second video that shows a group of the Knights soccer players drinking Pepsi and using cans to set up an improvised field in a parking lot to play their favorite sport. The Kennedy video was one of two to win the contest. 73 videos from New Jersey and Connecticut competed. “Everyone at the Kennedy Complex who saw the video has been really impressed by it. I want to congratulate our students for putting together a fantastic presentation, and for winning a free soccer clinic from a professional team,” said W. Scott Durham, athletic director at John F. Kennedy High School. Head soccer coach and television production teacher Richard Solis assisted the young people in creating the video. The video has a simple narrative. Four boys and two girls are on their way to soccer practice. Upon arrival, the group finds a sign on the soccer field fence that states the coach is out for lunch and will return in two hours. Bummed by the message, the young people sit on a curb to wait for the coach. A boy and girl take out Pepsi cans from their backpacks. Others follow suit. As they drink, the group is struck by an idea: they can use soda cans to set up goals and boundaries in the parking lot. The group ends up playing soccer on the asphalt. Two hours elapses. Sweaty players are seen sitting on the curb again. The coach arrives, opens the gate to the field, and beckons the group to practice. The eager players run to the field. Youth coaches from the New York City Football Club will hold a clinic for Kennedy students on Dec. 4, 2018.